The Credit Applications screen contains any credit applications you have received through your website that you have not archived or deleted yet. 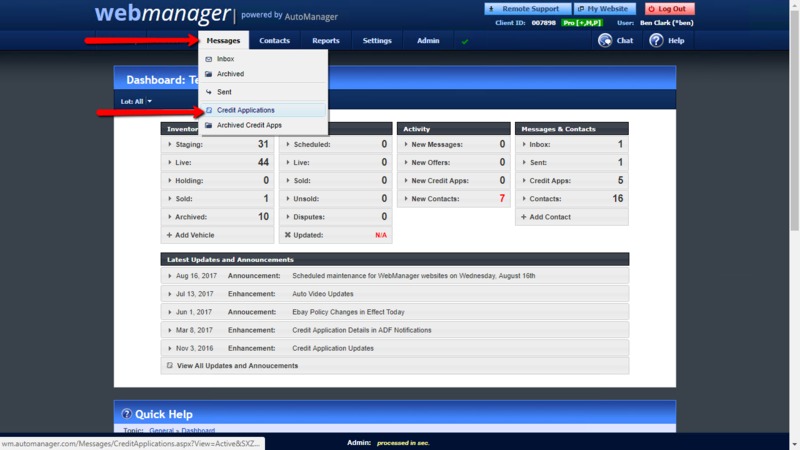 The Credit Applications screen can be accessed from anywhere in WebManager by hovering the mouse over Messages, then click Credit Applications. 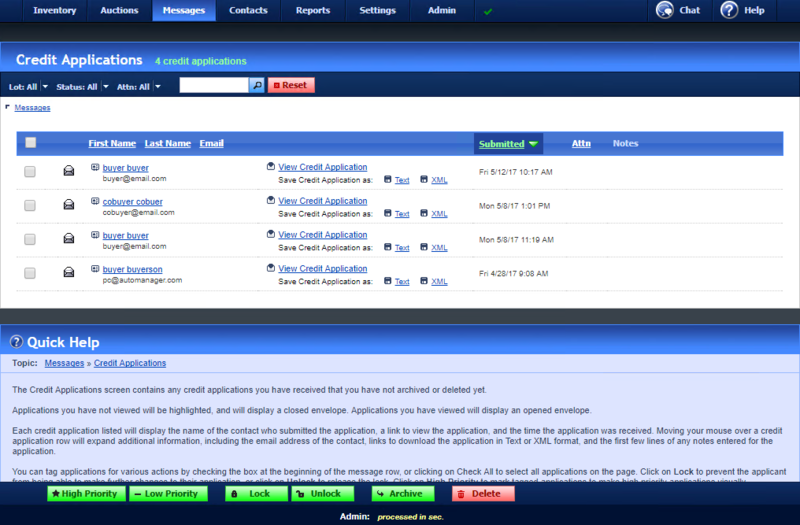 This view contains any credit applications you have received that you have not archived or deleted yet. Applications you have not viewed will be highlighted, and will display a closed envelope. Applications you have viewed will display an opened envelope. Each credit application listed will display the name of the contact who submitted the application, a link to view the application, and the time the application was received. Moving your mouse over a credit application row will expand additional information, including the email address of the contact, links to download the application in Text or XML format, and the first few lines of any notes entered for the application. You can tag applications for various actions by checking the box at the beginning of the message row, or clicking on Check All to select all applications on the page. Click on Lock to prevent the applicant from being able to make further changes to their application, or click on Unlock to release the lock. Click on High Priority to mark tagged applications to make high priority applications visually distinctive, or click on Low Priority to remove the mark. Click on Archive if you want to archive applications and be able to refer to them later. Click on Delete to permanently remove selected applications from the system. To view an application, click on View Credit Application or the notes when the you move your mouse over an application and the row expands.